Guesthouse provides a Quiet Relaxed Atmosphere and Convenient to all Tourist Destinations We have a deal with our nearby Hotel friends they allow our Guests to use their Swimming pool. Day tours with us. Feel free to ask for more details. 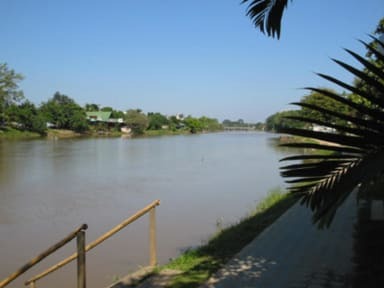 The Mea ping river While sitting in one of our Lounge chairs, you can watch the Best Sunset in town. All the Rooms Have Free Unlimited Wireless Internet . In All our Clean , spacious Rooms We Have Satellite TV, A Private Bathroom with Hot Shower, Fluffy Towels, and Comfortable Mattress . We Also Provide Free Bicycles to Explore The City. We Even Have Free City Maps. This was a lovely little hostel. The location was ideal, it was a lovely setting with super cute decor in communal area and the staff were super helpful; very friendly and happy to help with booking anything we required. Thank you very much! 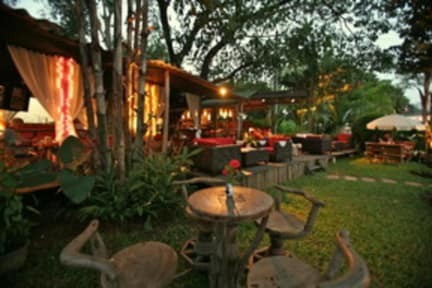 It was an awesome stay in Chiang Mai, staff is very friendly, they offer a good menu with delicious food for a good price. The bike rental is complimentary, however the guesthouse house location is a little far but you can always rent a motorbike to save some money. The tuk Tuks are expensive ! We stayed on our first night in Chiang Mai. The only downfall is that it is a little out of the way but once you get there it's the most relaxing environment. It's along the river and about a 25 minute walk to the old city. The staff was very nice and the rooms were clean, they have a restaurant and a bar as well which has good food. Probably more of a place for couples who would like to have a relaxing time. Great little spot and close to the bus station. Staff are friendly and it’s a nice place to relax out of the hustle and bustle. The pictures make this place look a lot nicer than it is. With that said, we had a good stay at the Hollanda Montri guesthouse. The staff was very friendly, the location on the water was beautiful, especially for loi krathong, and free pool was a plus. We stayed here for two weeks. If I were to go back, I'd probably stay somewhere else. It's a great spot for a few nights, but not for any longer than that. Our AC unit woke us up consistently and we didn't have hot water in our shower for a while. A bit disappointed with the room as we booked a deluxe room but it was nothing like it looked in the pictures. If that was the deluxe then it makes me wonder what a standard was like? When we got there we had to fix the window as the lock was broken so someone could easily get in, thank god my partner is a labourer so he could fix it but any normal person wouldn't of been able to figure it out. They stated there was a small fee for washing, but they tried to charge us 15 baht per item. Reception was kind and even went looking for my friend when we were seperated and she got lost in town. We booked the suite, but both chairs and bed were literally falling apart before our eyes. Security consisted of a padlock on outside of door. From the inside my 110lb frame could have pushed inside with little effort. Luckily we felt safe in this area the whole time and It was nice to be removed from the chaos of inside city walls. 10 minute tuk tuk ride to everything. Early check in a plus! Quite cheap place to book a single room. The staff was nice and the lounge bar on the riverside is great. However, I didn’t like the room at all because of it looked old and damaged, I had many trouble with the power supply even using my adaptator. And overall, it’s isolated from everything. There’s nothing convenient in the area, kind of deadplace in Chiang Mai. Not to be nasty, but I didn’t like the experience. Not my style. Very run down, doesn't look like the pictures in the least. Bed was so bad, hard as a rock. 30 mins from old city which is convenient. No real restaurants around so you have to walk or tuk Tuk to old city. Don't eat there food is really bad.